ServiceDesk Plus Cloud is a SaaS-based, ITIL compliant hosted help desk and asset management application for businesses of all sizes. The application can be accessed over the internet without installing any software. ServiceDesk Plus Cloud has been built on a robust SaaS framework adopting best practices approach to deliver a scalable, highly available and secure help desk and asset management solution on the cloud. 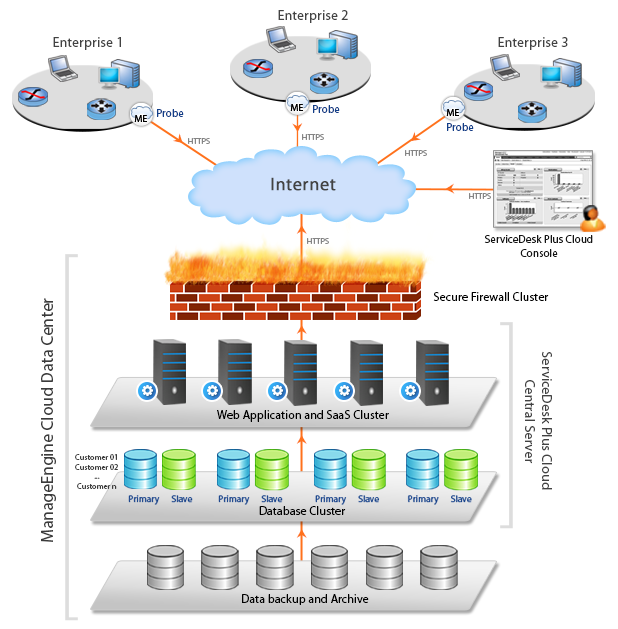 There is also ample provision for live backup of data and disaster recovery. How does ServiceDesk Plus Cloud work? Central Server is the nerve center of ServiceDesk Plus Cloud. All the helpdesk operations and customer information are stored in the central server, hosted in a secure data center. End users access the ServiceDesk Plus Cloud through a web interface, which can be launched on standard web browsers. Apart from the standard ticket management system, ServiceDesk Plus Cloud has other ITIL modules providing robust incident management, problem management and change management. There is also an asset management system to handle purchase and contracts. ServiceDesk Plus Cloud has been designed to cater to the needs of not just the enterprises that are confined to a single location, but also those spread across multiple locations, helping them collaborate IT helpdesk efforts. Remote probes, which are light-weight executables, typically reside in customer’s network and are used to automatically scan IT assets for asset management. Deployment of probes eliminates manual intervention normally associated with asset scanning in that particular network. ServiceDesk Plus Cloud is hosted in secure data centers and all communication between the web-interface at your end and central server are protected by enterprise-class encryption. It has been designed to offer maximum security at all stages - user authentication, data transmission, access and entire work flow. All sensitive data are stored in encrypted form in the data centers. In addition, the data centers where the customer data resides, have been devised to follow security best practices at all levels – physical, technical, people and processes. The inherent live replication, scheduled backup and high availability architecture prevents data loss and ensures business continuity. How data is segmented ? All customers data are segregated logically at software level. By default, segmented database will be allocated on the organization signup and it can be upgraded to dedicated database on additional cost. What do you require to access ServiceDesk Plus Cloud? To get started with ServiceDesk Plus Cloud and access data, all that you need is a standard web-browser like Internet Explorer, Firefox, Chrome etc. If you choose to install probes for automatic asset scanning, you can deploy them on Windows.